No Compulsory Redundancies! Stop Course Closures! Defend the Contract! Vote YES for Industrial Action! 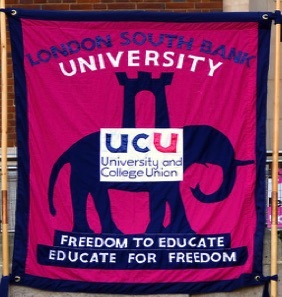 On Wednesday afternoon 2 May, the recognised trade unions at LSBU (UCU, UNISON and GMB) were invited to attend a hastily convened meeting with the Vice Chancellor. At this meeting the VC confirmed what UCU had communicated to its members and the other unions on the 26 April. 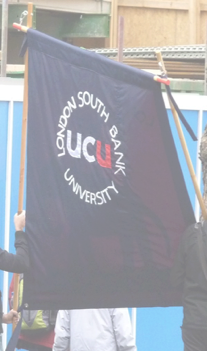 UCU said that LSBU was planning staff efficiencies that will lead to “a programme of large scale redundancies across the university.” While no precise figure was given of how many jobs they are planning to axe, the savings of £5 to £8 million pounds to the staff Budget suggests a redundancy target of upwards of a hundred jobs with a decision deadline set for between 15 - 31 May. The email staff received on 3 May fromt the VC is a long-winded attempt to justify what is essentially a poorly managed situation that is at best irresponsible and at worst a premeditated plan that has been long in the making and deliberately timed to minimise opposition and proper negotiation. The separate announcement on 25 April 2018 of course closures with attendant redundancies that include, the UCU Branch Secretary, and, UCU rep, in the School of Health and Social Care, would suggest the latter. The VC made it clear that the current redundancies in HSC were in addition to, not part of his plan, so HSC could face further reductions in staff. The VC presented his plans as a consultative exercise inviting the unions to engage in a civil manner. We made it clear that we believed that the time frame for discussion was far too short given the magnitude of what is being planned. People's livelihoods, careers, and mortgages are under threat with very little notice. The unions invited the VC in the spirit of meaningful consultation to consider postponing these planned redundancies for another year to give the university time to reflect more fully on what it is doing and to give staff affected more time to plan ahead. The university is well able to afford this as it has a £40 million pound cash reserve. The VC flatly rejected this proposal and indicated that the management were committed to a plan of action which we believe is neither civilised nor justified. Everyone is affected by these plans because no one knows who is affected. This time we really are all in it together. In spite of the praise we receive for our hard work and sacrifices that have included a constant trickle of job losses with the consequent increase in workload for those of us remaining, this management continues to demand more and more from staff and offer less and less to students. The idea that this “is an opportunity for us to emerge as a stronger university, better equipped to meet the future needs of students, employers and our community” is ludicrous and delusory. Rather it is an insensitive slap in the face to all of us. While staff redundancies will certainly meet the needs of the VC and his Executive on inflated salaries, how does closing down courses and making staff redundant meet the needs of students and make the university stronger? 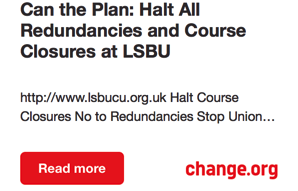 The proposed plan with its timescale is guaranteed to plunge the university in to a damaging spiral of destabilisation and further dent low staff morale. UCU, UNISON and GMB say enough is enough. Unless the VC and Board of Governors are prepared to listen to our reasonable proposal to postpone these plans for another year, we will be left with no other choice but to move towards balloting for industrial action to stop this barbaric initiative. University staff across the country are pushing back similar plans with stunning successes. 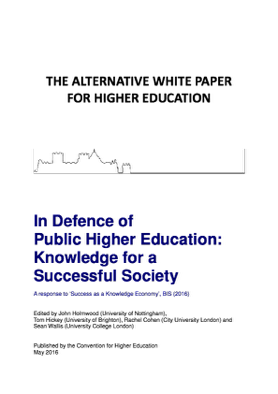 The recent USS strike as well as the action taken at the Open University and Oxford University have demonstrated that damaging plans like these can be stopped in their tracks. 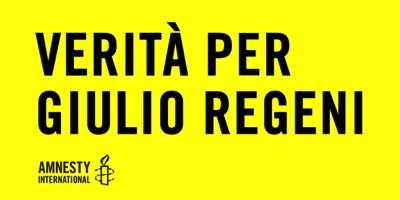 In the coming days we will be planning joint union meetings and protest action as we build the opposition and resistance in the cause of defending Higher Education against the asset strippers. The result of the consultative ballot was one of overwhelming support for both strike action and action short of a strike in opposition to compulsory redundancies. This has placed UCU negotiators in a stronger position in seeking to avoid staff being thrown out of work.